HMD Global had a really successful MWC, at least according to public interest and media reactions. At last year’s MWC Nokia brand was resurrected in the consumer marketplace thanks to a genius marketing move of bringing back the Nokia 3310. This year, HMD Global brought back another legend, the Nokia 8110 4G, but more importantly, the company announced attractive smartphones, that also gathered a lot of attention. 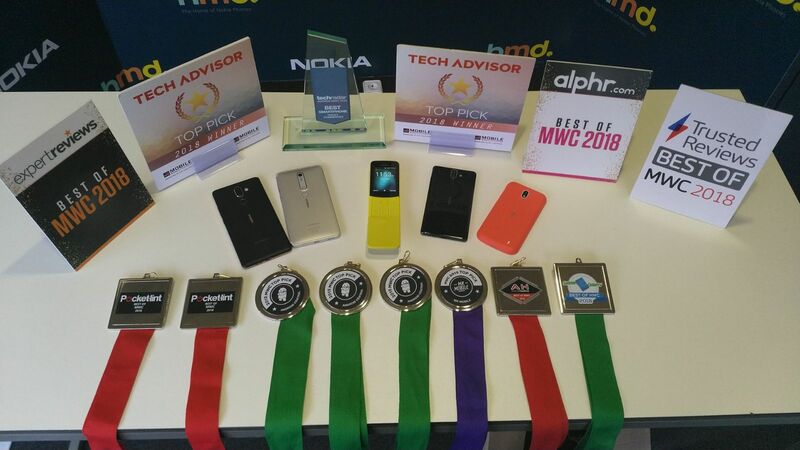 HMD Global executives shared on Twitter that HMD won 25 awards on this year’s MWC. To be precise, HMD CPO says 21, while VP for India says 25 awards. That’s not so important compared to the positive reception the phones got from the media. To be clear, things aren’t perfect, especially on Nokia 8 Sirocco data sheet, that lacks OIS or a 3.5mm headphone jack, but overall, the lineup looks promising. Company Brandwatch, in partnership with Twitter, tracked the mentions of a brand during the four days of MWC. On day one, when Samsung and HMD had announcements, Nokia was the most mentioned brand, while Samsung took the second spot. On day 2, Nokia was again the most mentioned brand, and Samsung the 2nd, while during day 3 Nokia got spot 5, with Huawei taking spot No.1. On the last day, day 4 – Nokia went to No.2, with Asus being No1. Overall, the Nokia brand, was the most mentioned brand during MWC 2018 on Twitter. #Nokia 3 passes #FCC. #HMD bringing new smartphones to #US?